Last Friday, Victoria and Argonia-Attica showcased their great depth, experience and improvement. At Sharon Springs-Wallace County, Victoria won 40-8. After the game’s first two plays, senior Joe Dortland exited with a broken collarbone. Dortland had played very well in his first career starts at quarterback after he took over for all-state quarterback/safety Brady Dinkel following Week 1. Dinkel missed seven games with health issues. Once Dortland left, Dinkel immediately stepped back in at quarterback and eventually threw a great touchdown pass in the corner a few snaps later. Dinkel eventually accounted for five touchdowns. The senior-laden defensive line contained Wallace County’s standout quarterback Eric Gfeller. In 114 opponents’ carries in the last four games, Gfeller’s 15-yard run late in a 40-8 Victoria victory is the longest run allowed by Victoria’s defense. Last year, the Knights pulled away late to beat Wallace County, 28-12, in sub-state. For the season, Victoria has permitted just 2.5 yards per carry, better numbers than its 12-1 season that yielded a state championship last year. 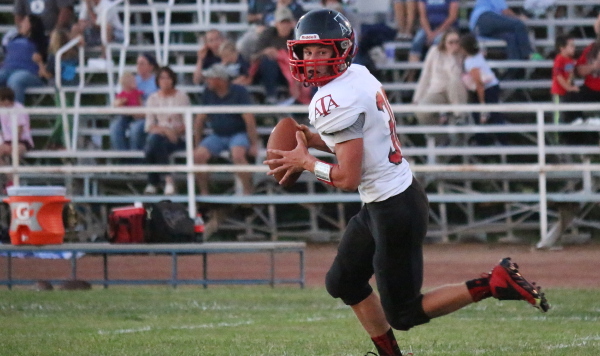 Several hours east, Argonia-Attica rolled over Axtell, 52-0. A&A co-coach Luke Greenwood, in charge of the offense, said it was probably the best all-around performance by the Titans in the three-year, co-operative agreement that’s produced 5-4, 12-1 and 12-0 records. A&A defeated Axtell, 70-44, in sub-state last fall. The defense continued its marked improvement from 2014, and a balanced offense led by senior quarterback Alec McDaniel and transfer Jacob Norris delivered another fine game. “Instead of having to rely on one or two guys to carry the load, we have got five or six,” Greenwood said of the differences in the last two seasons. On Saturday, Victoria (11-0) and Argonia-Attica (12-0) have its rematch in the Eight-Man, Division II state championship from Newton’s Fischer Field. Game time is 3:30 p.m. Victoria rolled over A&A, 52-8, last season. The Knights have won 23 straight contests. Oberle and A&A assistant Monte Haxton are in-laws and great friends who normally talk every week during the season. The Knights are looking to win its seventh state title and first one in back-to-back years. Victoria has one other perfect season in school history, in 1998. Attica has one title in 1988, and a runner-up the year prior, while Argonia never made a state game. Victoria has 10 seniors, A&A has 12. The Titans enter this year as a seven-point favorite. Its defense allowed 28 points a game in 2014 and stands at 6.2 this fall, best in the classification. The Titans heavily relied on McDaniel last season, and had one of the all-time great statistical seasons with 3,253 total yards and 68 scores accounted for. This year, balance with McDaniel, running back Devon Newberry and Norris, a former Norwich quarterback who transferred in August, has yielded better per-play numbers. Last year, the Titans scored 751 points entering state, but averaged 8.1 yards per play. This year, it’s up to 9.96. Norris leads the team in special teams yards, receptions and ranks second in tackles. Newberry and McDaniel combine for 1,760 yards and 51 rushing touchdowns. “Last year when we were putting up pretty good numbers on offense, I think they kind of got too involved or too wrapped up in the scoring and what we were doing on offense, and they weren’t as concerned about defense, and then this year, they bought into not only scoring more on offense, but also keeping the other team from scoring,” Greenwood said. Victoria’s defensive line first gained acclaim when it permitted 110 total rushing yards on 100 carries in the final three playoff games last season. Seniors Eric McAlonan, Wheaton Hockersmith, Brandon Brungardt and Lane Kisner lead a defensive line that has allowed one running back, Northern Valley’s Jarell Seals in Week 5, to clear 100 yards. Victoria has contained four 1,000-yard backs in the last month. Victoria has continually overcome adversity both on and off the field and offered depth normally unmatched in the eight-man ranks. The Knights’ three leading rushers have between 602 and 668 yards. Senior Parker Riedel paces the team in rushing yards, and junior linebacker Bryant Karlin is one of the top-two tacklers. Both weigh under 140 pounds and been big surprises. Victoria has a total margin of 532-86. Entering state last season, the Knights stood at 509-206. On the field, the Knights never scored in the final 29 minutes in Week 1 and held on to beat Central Plains, 16-12, in a high-profile matchup. A few hours after the win, Dinkel was life-watched to Wichita. However, Victoria regrouped with Dortland. Then, they had to reshuffle last Friday when Dortland went down. In the second quarter, Riedel lost a fumble inside the Wallace County 5-yard line. Wallace County scored just before the half to cut the Knights’ lead to 16-8. However, Victoria regrouped and pulled away late. “Pretty resilient group, and they have been in that position before,” Oberle said.